It’s 30 litre capacity, it accepts standard bin liners and oh yes – it’s an intelligent bin. The Intelligent 30l Bin from Jaycar knows when you want open the lid – and opens it for you. Using motion sensors in its lid it detects when you are waving your hand around above it and opens automatically. Great – unlike with swing bins or pedal bins you don’t even need to make contact with the bin’s gleaming chrome surface: keeping yourself a bit cleaner and News3 also points out that this would be good for people with disabilities who find these things hard to operate. On the downside, waving your hand with rubbish in it over the bin could result in little pieces of tomato juice or whatever you’re holding getting splattered around the walls. 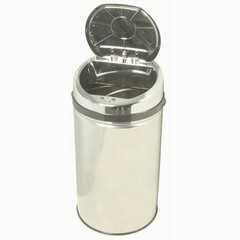 Or if if you’re just a heavy gesticulator you might just find the bin just popping open as you emphasise a point. Crazy. It runs off a pack of 6A batteries that need to be replaced approximately every 6 months.